CN was privatized on November 17, 1995, ending a decades-long ownership by the Canadian federal government. 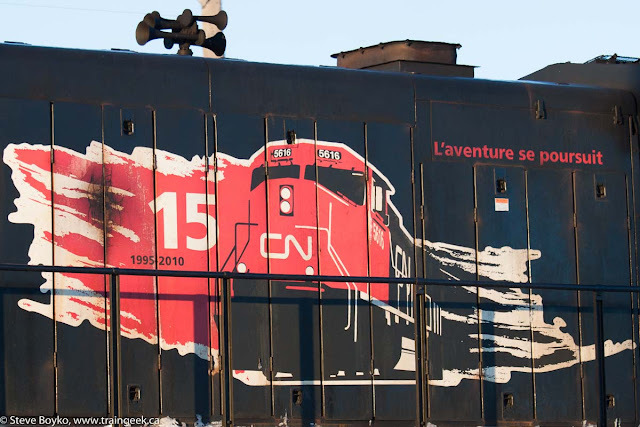 Just under 15 years later, CN started applying a "The journey continues / L'aventure se poursuit" 15 year logo to selected locomotives. In typical CN fashion one side of the locomotive received the English version and the other received the French version. 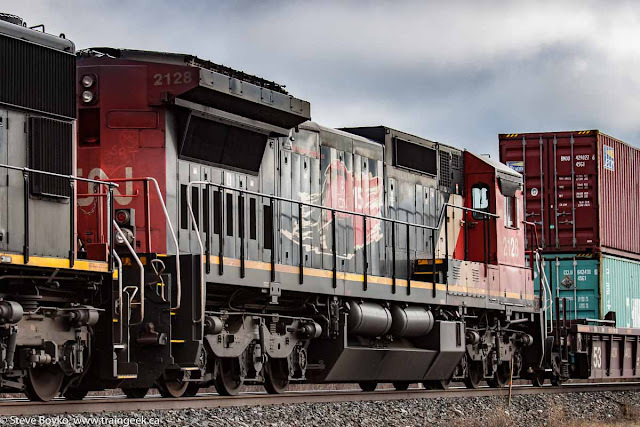 It's not unusual for CN or CP to apply special liveries to their locomotives. CP decorated a number of their locomotives for the 2010 Olympics in Vancouver, and several CN locomotives have received stickers for Ecoconnexions. 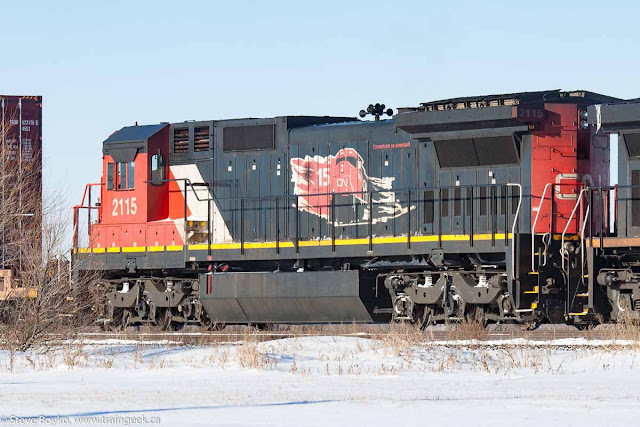 Two other locomotives received the 15 year logo that I am aware of: CN 7505, one of the humpyard dogs at Symington yard in Winnipeg, and CN 7258, a Winnipeg-assigned switcher. 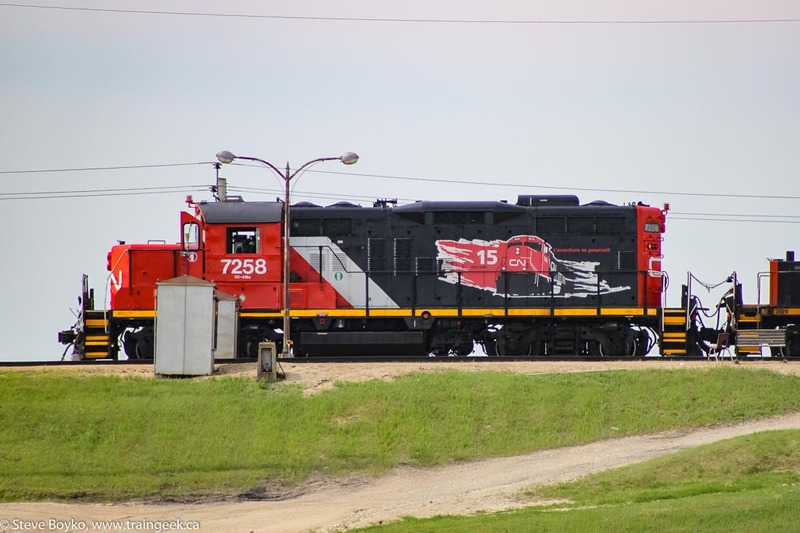 Have you seen any other "15 year" locomotives? You might also be interested in LogoDesignLove's article on CN's logo evolution, Trackside Treasure's post on the logo's 50 year anniversary, and Oil-Electric's post on the "bent paper clip". Thanks Taylor! I hope to "catch them all" at some point. CN's 100 is coming up in 2019, I wonder If CN will do anything special to mark the creation of the company. I wonder if CN will have a 100th Anniversary logo? Hey Steve, I believe there was some sort of larger EMD (maybe an SD70I or something) that got it. 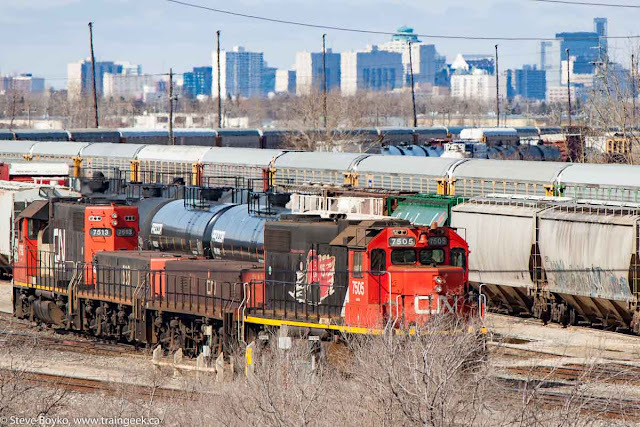 I heard the story was that it was the first locomotive delivered to a newly privatized CN. Hi Taylor (M), I haven't seen it but it is quite possible. Maybe one of the early 5600s? 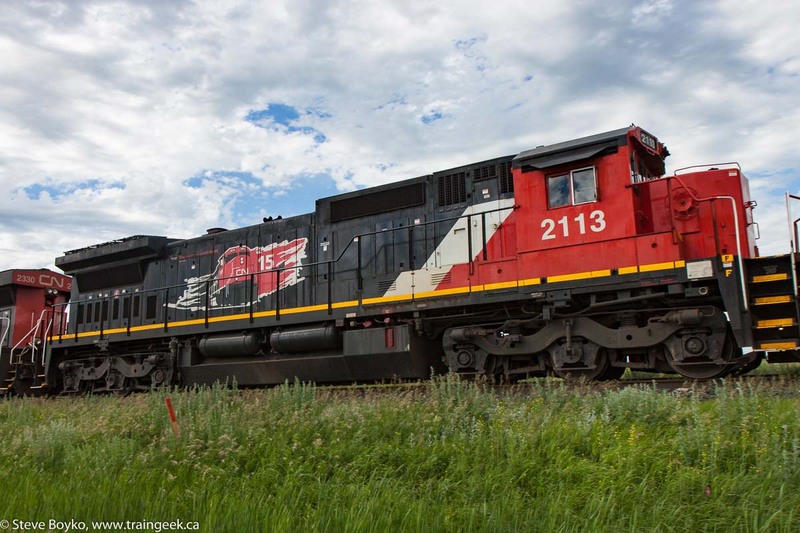 Hi shnorth123 I do hope CN does something to commemorate the 100th anniversary of Canadian National Railways.